We introduced some new products this year at our shows and the results have been stellar. Many have called and emailed to ask how to obtain more of the new products since we have not yet added them to the website. Though we are not quite ready to launch, the inquiries and phone orders convinced us to make the new products available on the website for the holiday season. Due to a wrist injury this year and not being able to give it the proper time to heal supplies are limited. Unfortunately, this is what happens when your product line is handmade, but using the FEEL BETTER BUTTER daily is what has enabled me to make the products available now. Feel Better Butter: May aid with inflammation from arthritis, joint pain, sore muscles after a workout, tired stiff achy muscles and more. Our Feel Better is CBD enriched 250mg from 99% hemp derived CBD isolate. Feel Better Formula: Our oil blend of Feel Better may aid with inflammation from arthritis, joint pain, sore muscles after a workout, tired stiff achy muscles and more. Our Feel Better is CBD enriched 250mg from 99% hemp derived CBD isolate. Feel Better Stick: For those busy days when you are on the run but still feeling a little pain, take the Feel Better Stick with you for easy access. May aid with inflammation from arthritis, joint pain, sore muscles after a workout, tired stiff achy muscles and more. A dot on your temples can aid in relieving headaches. 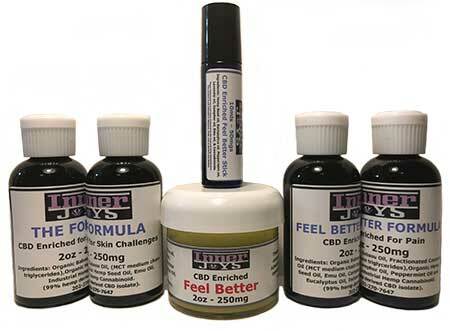 Our Feel Better is CBD enriched 50mg from 99% hemp derived CBD isolate.